After two years of doing the loop-the-loop around Mercury, MESSENGER has unveiled a bunch of surprises from Mercury — the closest planet to the Sun. The spacecraft launched in 2004 and made three flybys of the planet before settling into orbit two years ago today. Incredibly, MESSENGER is only the second NASA probe to visit Mercury; the first one, Mariner 10, only flew by a few times in the 1970s. It was an incredible feat for the time, but we didn’t even have a complete map of Mercury before MESSENGER arrived at the planet. 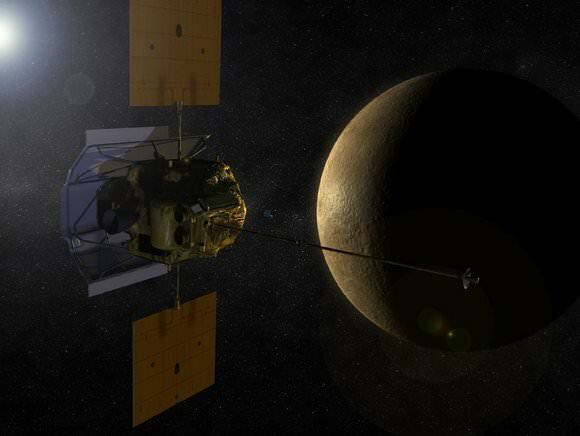 So, what have scientists found in MESSENGER’s two years in orbit? Tales of sulfur, organic materials and iron, it turns out. The magnetic field lines converge differently at the north and south poles of Mercury. What does this mean? There’s a larger “hole” at the south pole for charged particles to do their thing to the surface of Mercury. At the time this information was released, NASA said it’s possible that space weathering or erosion would be different at the north and south poles because of this. Charged particles on the surface would also add to Mercury’s wispy atmosphere. Wondering about the atmosphere on Mercury? It depends on the season, and also the element. The scientists found striking changes in calcium, magnesium and sodium when the planet was closer to and further from the sun. Late in 2012, NASA finally was able to corroborate some science results from about 20 years ago. Scientists on Earth saw “radar bright” images from Mercury in the 1990s, implying that there was ice and organic materials at the poles. MESSENGER finally confirmed that through three separate lines of investigation that were published in Science in 2012. Scientists estimated the planet holds between 100 billion and 1 trillion tons of water ice, perhaps as deep as 20 meters in some places. “Water ice passed three challenging tests and we know of no other compound that matches the characteristics we have measured with the MESSENGER spacecraft,” said MESSENGER principal investigator Sean Solomon in a NASA briefing. While scientists knew before that Mercury has an iron core, the sheer size of it surprised scientists. At 85%, the proportion of the core to the rest of the planet dwarfs its rocky solar system companions. Further, scientists measured Mercury’s gravity. From that, they were surprised to see that the planet had a partially liquid core. “The planet is sufficiently small that at one time many scientists thought the interior should have cooled to the point that the core would be solid,” stated Case Western Reserve University’s Steven A. Hauck II, a co-author of a paper on the topic that appeared in Science Express. At some point in Mercury’s history, it’s possible that it could have had lavas erupt and sprinkle the surface with sulfur, magnesium and similar materials. At any rate, what is known for sure is there is quite a bit of sulfur on Mercury’s surface. “None of the other terrestrial planets have such high levels of sulfur. We are seeing about ten times the amount of sulfur than on Earth and Mars,” said paper author Shoshana Weider of the Carnegie Institution of Washington. Previous PostPrevious What Glows Green In Space?